Lots of giveaways this week on the right sidebar. We went to the suit up event at JC Penney last Sunday for her school. It was what I thought and not. As I suspected, it was basically just a private shopping event for these college students. So it did not have any advice on what to wear or how to do one’s hair or anything like suggested in the pre-event info. I was worried it would not be a good discount but it was! My daughter got 3 pairs of dress pants, 9 shirts and a bra for just over 100 dollars. They even took the discount off clearance items! She was a bit disappointed because she needed a bigger size than she hoped, but at least she got some really nice things. AND at the end, we won the drawing for the $50 JC Penney gift card! My daughter has spent a lot of this week nauseous so she missed group, group activities, physical therapy, and we didn’t even go to quilting. This gave me lots of time to catch up on things at home like paperwork which has piled up. It’s raining Friday and all weekend, so I did my shopping while my daughter was in class. I found there is a nearby Aldi and really they have a great selection of gluten-free, organic produce, meat and dairy. I wish they had grass-fed beef other than ground beef, but everything they have is at a great price so no complaining. I sadly spent a lot of my free time, about 8 hours untangling yarn. I wound this skein in the usual way but it just tangled up at every opportunity. Thank goodness the slouch hat is complete. I’m using the leftover yarn from this to make a lighter weight dog sweater for Ginger, who belongs to our friend, Amy. I seem to not be having tangles now. I am reading some really great books which I am truly enjoying. I am happy to report I have read ALL 4 of the ARCs I got last week and have posted my review already on 2 of them. 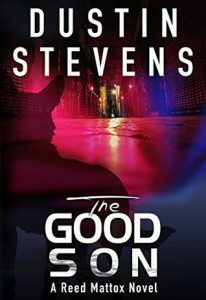 I also loved all the K9 books I read for my SoS feature and I thought it was a fun pick for this month’s focus. I’m excited this coming week with Easter, my daughter only has class tomorow on Monday so we will have more free time. In addition to reading (shocker), I hope to do some more sort and throw, house cleaning, and convert it to digital projects. We might spend some extra time with crafts like quilting or sewing or knitting also. Thank you so much Montlake Romance and AceRoc / Berkley Publishing. If you like this and want to see me do the Sunday post, as often as I can manage, leave me a comment and let me know. I love your comments and shared ideas! How great that your daughter got so many different clothes for so cheap! But not so cool about not getting any advice. I would love to have someone telling me what style suits me best! I hope you’ll enjoy your new books, Anne! Thanks Lexxie. I think she got some great things but it was tiring for her. Neat that you gals got such a great discount and won the GC. The slouch hat looks great. Sorry to hear she was feeling yucky. Way to go reading through all four ARCs. 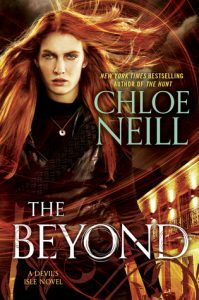 I enjoyed a Readathon with one of my challenge groups, but got a couple ARCs read that counted. 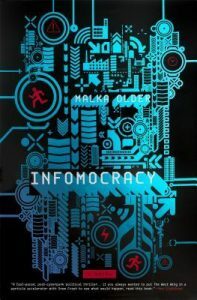 This week I have all ARC reading now that the RAT is over. I got the latest Mercy book, too. Hopefully your projects next week will go well. I love the feeling of going through stuff and getting things organized. It was a surprising productive week for me. I love getting things figured out and organized. Have a great week Sophia! Thanks! It was good. I don’t know what we will get yet but it was a worthwhile outing. Omg that is such a great sale. I love myself sales and anything free. This Friday I may have the chance to get $100 just for showing up to an Early Childhood event for parents. And I’ve scored two Amazon cards this year alone. Yes I didn’t expect it to be so good. I was shocked to win, well always I am. The only thing I usually win is the occasional Goodreads giveaway or challenge things. I love getting a good deal on anything. The hat looks great! Ugh, untangling yarn. I don’t have the patience. enjoy your week and happy reading. Between that and the $2 jeans the week before we are doing great. The tangled yarn was a severe bummer but at least it is complete. Have a wonderful week with great reads! I love the slouchy hat…and the books look tempting. Thanks for sharing, and enjoy the week. Thanks for visiting my blog. Congrats on the win! I just bought a bunch of stuff from JCpenny for Florida, sometimes they have some pretty awesome sales. Sorry your daughter still wasn’t feeling well. We did easter this weekend with the kids since we will be away for easter and I didn’t want to bring all the stuff with us. Thank you! Have an amazing trip and vacation. I saw your fun Easter pics! Nice that you got some great deals shopping and yay for winning the gift card! To bad you didn’t get the fashion advice you were hoping for. I get ideas for what to wear on Pinterest and I follow a couple of fashion bloggers on Instagram. Plus they usually give you the heads up on sales. I buy a lot on-line and it usually works out. Thank you! I think she was disappointed not to get the advice but I wasn’t surprised. It was supposed to be for business wear but they had all kinds of stuff. I buy a bunch of casual clothes online. She has bought a few things at thredUp too. For some reason I usually read that series. But I do the same thing usually I pick a format and stay with it for the series. That was such a great sale. I’m happy to hear your daughter got so many clothes at such a great price. 🙂 I hope you and your daughter have a great on the week before Easter. Thank you. It will be great because we have a long weekend just today with classes and then really 6 days off. Of course we still have all the medical appointments. What a bargain on the clothes! I could do with an event like that… My wardrobe needs some updating! Yes, she did get a bra and half of the tops were casual not business but the pants were all dressy. So she has a nice starter wardrobe. I got a few ARC’s that won’t go live for a couple of months but it’s nice to be able to read books I wanted early. That was a great amount of clothes for the price and congrats on winning the drawing. I thought it was a great event for us. It did seem like an incredible waste of time over 2 days. Well it’s done and hopefully that won’t happen again. Thank you! What a fun shopping trip with your daughter Anne! How lucky that she won the JC Penny Gift Card! I hope she feels better. It’s no fun being sick! You have a lot fun giveaways going on. I need to start doing more of those on my blog! 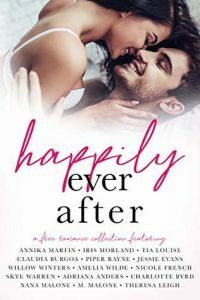 The Happily Ever After Anthology looks like it’s something I would enjoy. Thanks for putting it on my radar. Hope you have a great week! It was a good deal for us. She is struggling back and seems to have more mental energy even if she still isn’t all the way back physically. We’ll see how it goes today with school and medical appointments, a long day. She will probably nap the few hours between them. I’ve tried hard to create some interesting memes and giveaways. I have a few of those anthologies which include authors I know and enjoy, so they are really amazing freebies. Although since they are like 2000-3000 pages I have trouble getting time to read them! But they are worth it even if you only read 1-2 books of authors you already know and enjoy. It is snowing here so I can definitely relate to the weather woes! Hopefully things clear up and are nice for Easter! Thank you! It does look to be beautiful here in the 60-70s and only raining on Friday. And a fabulous week with time to do things! You did great shopping! Hope you enjoy your books and have a great week! Aldi is great for gluten free. They are a German company and Germany has wonderful gluten free options. Hopefully your daughter feels better this week and you guys can enjoy some down time! I read that about Aldi and I’ve been going there about every 2-3 weeks. If we move closer to one, I could see it being our main grocery for fresh stuff and that is more of what we eat these days. Sorry your daughter hasn’t been feeling well; I hope this week goes better for her. The hat looks great, and I love the colors of that yarn. I wish there were an Aldi closer to me. The nearest one is about 45 minutes away… if the traffic is good. Even the nearest Wegman’s is at least 30 minutes away on a good day. It’s the price we pay for living more-or-less in the country. yes I am enjoying Aldi more. I think some of the prices and selection are better on foods than Walmart. Our local Walmart (1.5mi) is really good and has a nice GF section but some of them don’t at all. We are looking at moving and I am keenly aware of that. We also find some things at Trader Joes. I looked at a great place to live yesterday but I have to look at how close it is to the things we do most often. It is out a bit but they do have great shopping close by. It’s closer to her school, but I’m more worried about weekly medical appts. I love the colors of the yarn but wow this one was tangly and scratchy. I’ve used this yarn before and don’t remember that happening so it could be I just had a bad winding. I have my own swift and winder. That’s so neat that she got some good deals and a gift card!! ❤️ Hope your week is stellar Anne and you get tons done. Thank you! I always want to get MORE accomplished. I try to figure out the most efficient way to pack in errands around already being in that area. Etc. Clothes are so expensive, my oldest daughter is a clothes horse but luckily she funds her own habit now. My youngest daughter couldn’t care less, she just lives in shorts and T-shirt’s , and the odd hand me down. Clothes can be expensive. That’s why for the everyday, casual stuff we often thrift shop. My niece wanted the latest fashions every 2 months and used to sell them to a place like Plato’s Closet and get new so ofte. *smh* I have clothes that are seriously 45 years old! I can still wear my ski bibs and jacket from high school! Hope she’s feeling better this week, but glad you got some stuff done. And good reading! I’ve been hit and miss with the books lately. It was a decent week for me. This week will be interesting. I am researching whether we will move this summer. But she has no more classes now that today is finished and so far we have nothing on the calendar for Thur-Sunday but plenty to do. That’s a great buy on the clothing. Stuff like that can be so expensive. 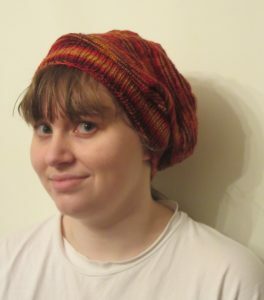 I also love the slouch cap. I ended up having to order a ponytail cap this past winter because I have so much hair it always looks funny. I couldn’t find one locally. Sounds like you’re getting a lot of reading done so kuddos to you. Hope your daughter is feeling better now. Have a great week! Thank you! We thought we did well. The slouch hats are awesome because my daughter can tuck all her hair into it. Her hair is past her waist. Awesome deals at Penney’s! And congrats on winning the gift card! 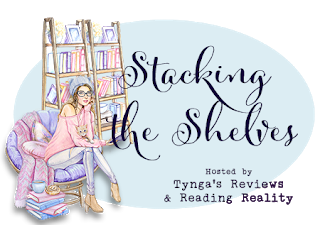 Go you on being caught up with your arcs! That’s an accomplishment in itself. Hope your week is off to a good start! Thank you! I am off and running at a blistering pace. I have lots of research to do right now but thankfully our schedule is open now Thursday-Sunday with her school break. I’m trying to get a bit ahead on ARCs for a short trip in May. I am happy to see Kendra Elliot on your list, I hear her books are great rom suspense. That sounds like some great deals, I love finding those. Especially since good clothes are so expensive now a days. Thank you! 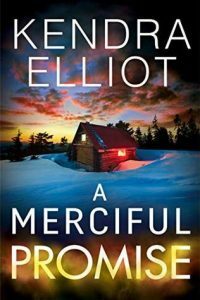 I have been enjoying the Kendra Elliot books – this one is number 6. Nice slouchy hat! I like to crochet (very rarely, usually only when I’m pregnant), and find it to be calming. I really like to listen to audiobooks while I crochet, because it gives my hands something to do. Lately, my hands have too many things to do, so my blanket remains unfinished in the closet. I did make one for my son a few months ago, because he asked, and I couldn’t say no! Hah! I hope you have a lovely week! Thanks Lindsi! I like to listen while I craft. My daughter now has 3 of these hats in 3 color palettes and wears them all the time. It’s a great pattern. She likes it to keep her long hair tucked up and out of the way. And it’s stylish. lol I have had almost no time this week either because when she is in appointments instead of listen and knit, I have been listen and run errands. The JC Penney event sounds like it turned out to be worthwhile! I’ve never heard of anything like it. What a great idea though! I hope your daughter is feeling much better now. Both of your new books sound wonderful–and right up my alley. I hope you love them. I really like the Sunday Post–and wish I could manage once a week. I want to do more, but it feels like my blogging time is really suffering right now. I hear you! I always want to do more. 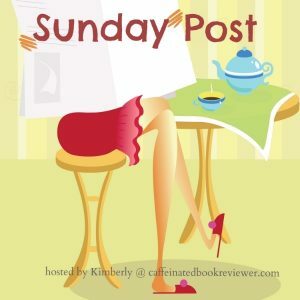 I update the Sunday post throughout the week with incoming ARCs and freebies so all I have to do on Saturday is write the week part. Sometimes I even write a paragraph during the week if I have something I want to say. Once a month, I copy the format to all the Sundays of the next month in draft. So it isn’t too much work. The time-consuming thing is trying to comment on everyone else’s posts but I love seeing what is happening with them and their new books. I’d say keep it simple. Some people just list their last week’s reviews and the upcoming one which can be auto-generated in UBB I think. I originally though I would only do it once a month but it’s part of my weekly routine now.